Entertainment Earth's next 6-inch The Black Series exclusive! Four awesome troopers from the Grand Army of the Republic. 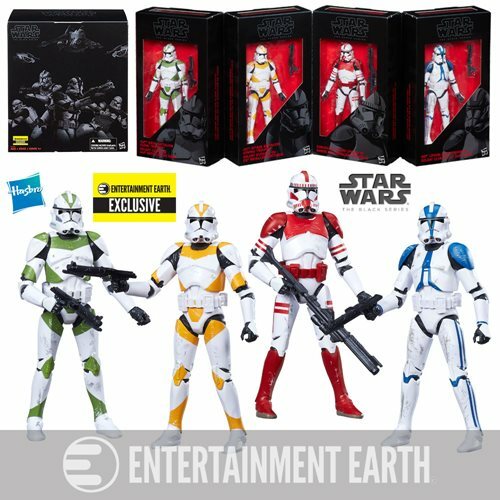 Set includes the first-ever 6-inch Clone Troopers based on the legions from Revenge of the Sith! Each figure features awesome weapons and amazing paint! Entertainment Earth Exclusive! Bring home an entire army in one box with this Star Wars The Black Series Clone Troopers of Order 66 6-Inch Action Figures - Entertainment Earth Exclusive. The set brings you four 6-inch scale plastic action figures in the employ of the Republic. Each features awesome weapons and amazing paint, so you really should pick up a few of them to serve the Jedi - until they decide to move in a different direction. Ages 4 and up. 501st Legion Clone Trooper - Vader's Fist! Blue-striped action figure is ready to serve Anakin Skywalker, and later Darth Vader, during the Clone Wars. 212th Attack Battalion Clone Trooper - Orange you glad Obi-Wan Kenobi's Clones are here? Standing 6-inches tall, this super-articulated figure comes armed to take aim at threats on Utapau - and eventually one Jedi Master Kenobi. 442nd Siege Battalion Clone Trooper - Crush Cato Nemoidia! These lean mean green biological fighting machines were sent to crush the Trade Federation stronghold during the final hours of the Clone Wars. Shock Trooper - The Emperor's squad! Charged with keeping Coruscant and the Emperor safe, these red-clad troopers are ready to help, and also mow down opposition to Palpatine's New Order. *Manufacturer reserves the right to sell this item in other markets.